Unfortunately, in the social space we’re operating in, we totally have pay to play. But running ads on your favorite social sites doesn’t need to be a scary process. This first part of a multi-part series will help get you acquainted with Facebook, Instagram and Twitter ads so you feel confident and ready to launch new content and ads like a social media pro. Ready to get started? Let’s do this sister. Today, we’re starting with Facebook, specifically establishing yourself a Business Facebook profile and preparing your back-end to support ads. Establishing a Business Manager profile on Facebook allows you to better cultivate ads to target your ideal customers on both Facebook and Instagram. If you’ve begun dabbling in social ads already, chances are, you’ve thought about “Boosting” one of your organic social posts – putting a little money behind it to reach new customers. Establishing your Business Profile allows you more fine tuning of your social ads, to ensure you’re spending your money as efficiently as possible and targeting towards things that actually matter to you and your customers. Chances are you may have already created a Page for your side hustle, and if you have – great! If not, let’s get that set up real quick. Your Facebook Page is an online persona for your business. 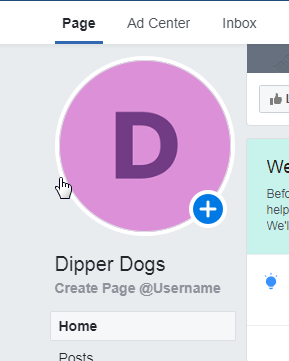 This is where you can post updates about new content or products, spark discussions relevant to your business and is the page your ads will post from. To create a page, visit your personal Facebook page. On your Home or Newsfeed, navigate to the upper right-hand corner. You’ll see quick links to new Friend requests, Notifications and Facebook Messenger. Click the Create link next to Home. Select the first option, Page. You’ll select whether your page is for a Business or Brand, or for a Community or Public Figure. Business or Brand: a Business or a Brand has an established business address. Think Brick and Mortar stores or restaurants, or brands with established HQs. Community or Public Figure: This is used for online personas and platforms that do not operate from a physical location. Name your page. You’ll need to also select the category of your page. (Business, Blog, Personal Blogger, Pet Supplies, Restaurant, Gym etc.) so it’s easier for potential clients to find you. HOT TIP: If you have an idea of what you want your page to be named, or you’re utilizing your brand’s name, do a quick search of your brand’s name in Facebook, Twitter, Instagram and Google. Be sure to claim any and all handles and your domain as soon as possible. This also allows you to see if your ideal brand name maybe has some other connotation that doesn’t fit the reputation of your ideal side hustle. The internet is dark and full of terrors, so you might want to consider entering your brand name into Urban Dictionary too. From there – your page is created. Facebook provides pretty easy to follow steps to help you get your page set up: adding profile and cover images, adding information about your brand, linking to an Instagram account, etc. Now we’re ready to get you set up with Business Manager. Navigate to business.facebook.com. In the upper right corner, select Create Account. Enter your business name, your name, and your business email. 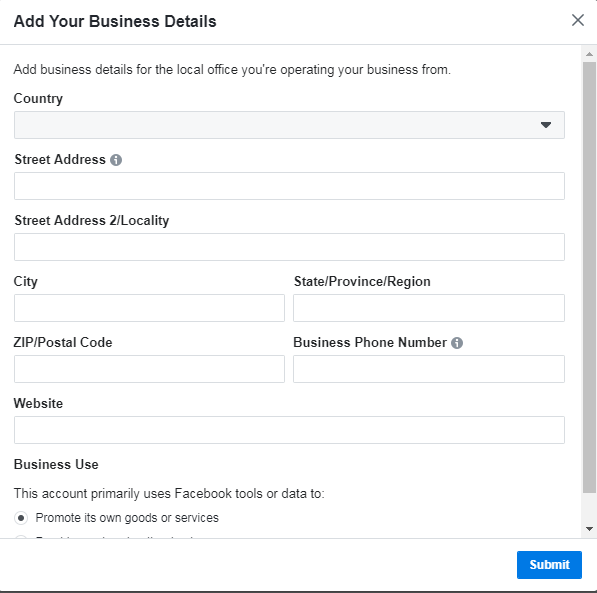 Add a street address for your business (this will not be public on your Facebook page unless you allow it) and your website. Identify your business use from the two options available. Most select the option to promote their own goods and services. In the top right corner of your business manager homepage, there will be three lines stacked on top of each other. (I call this the Hamburger Menu.) Click on it. In the drop down menu that populates, Click on Settings. This is the back-end support that will help you manage your Facebook ad spend and ensure any ads are accurately reporting back to you. Select Ad Account from the menu on the left and follow Facebook’s directions at establishing an ad account. You’ll need to indicate who you plan to use the ad account for. If you’ll be creating ads for yourself, select the top option. Doing this sets your account up as an entity within Facebook’s system. It’s what protects your identity and your payment information by assigning you a random Ad Account ID. 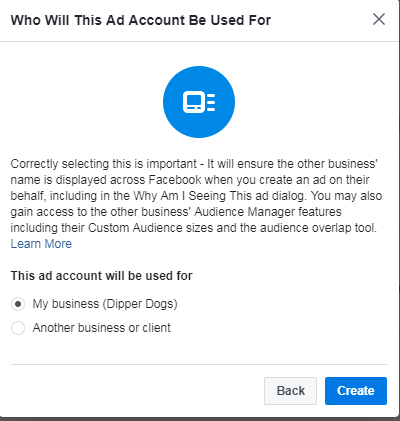 You can modify your account to be named after the business you’re managing and assign other people who might be running ads access to your advertising account. On the left hand panel, if you navigate down to Payments, you can add a method of payment to charge your ads here so they are auto-charged at the end of your campaigns. Facebook accepts all major credit cards and Paypal. Now that you’ve established your ad account, you’re almost ready to begin creating ads. However, we need to establish a Facebook Pixel so any ads you run can connect with your website. 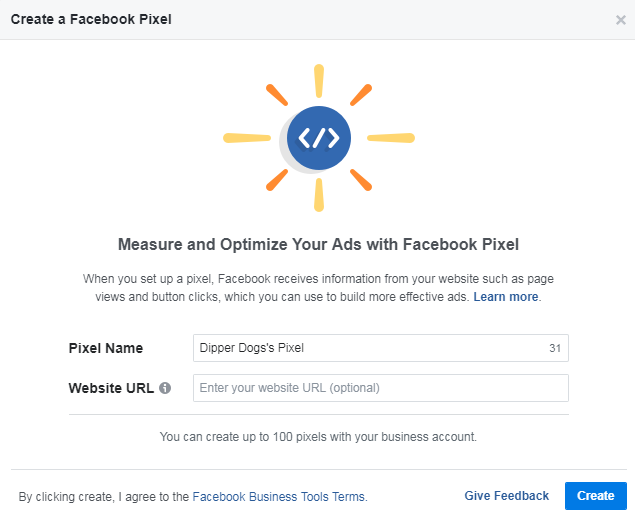 A Facebook Pixel is an analytics tool that allows us to measure the effectiveness of our ads by tracking what actions people take on your website. If you’re using Facebook ads to showcase a new product, and including a link to your website where people can purchase it, the Pixel will track how many clicks on the page and the conversions (or purchases) on the website made via that link. If you’re a blogger and using Facebook ads to highlight a new piece of content, a pixel will be able to track not only how many link clicks, but also the average time people spent on your page, the average number of clicks to other pages, etc. To establish your Pixel, start in the Hamburger Menu, and select Events Manager. Once there, click Add New Data Source. Name your Pixel and enter your website. You’ll be taken to another screen inviting you to install your pixel. Most website hosting platforms like Wix or Squarespace have integrations with Facebook to make installing your Pixel on your website super easy. If your hosting platform does not appear on the options in the first selection, you can either embed the HTML code into your website yourself, or email the directions to your web developer. After the Pixel has been installed, you’ll need to set up events. Facebook, again, has a really straight forward process for setting up this process. Once the pixel is installed, speaking to Facebook and your events established. Your account is totally ready to start creating and running some ads. Next week, we’ll give you an overview of what kind of Facebook ads you should run based on your audiences, objectives and platforms. The week after that, we’ll provide a step-by-step overview of how to actually build your campaigns and ads in Facebook Business Manager. Have more questions? Feel free to contact us at hello@campaignher.com, or leave your question in the comments below.